WOW, how can I eloquently convey the essence of our sailing life so that the emotions, body workouts, and hard boat work comes across to our followers. Friday, Sept 18. First day was emotionally difficult as Mom and Karen came to the dock to wish us a safe journey, big hug and kissed my cheeks. As I steered through the channel across the bar, Mom and Karen sat up on the lookout watching and waving. Tears slipped down my cheeks as I steered the boat across the bar. having been a landlubber for nearly 6 weeks we knew we wouldn’t have our sea legs back. As we got further offshore I could tell I needed meds to help the first day or so. Cape Blanco offered lots of whale viewing, John was able to get some great pictures that he will post when we get fast wifi. 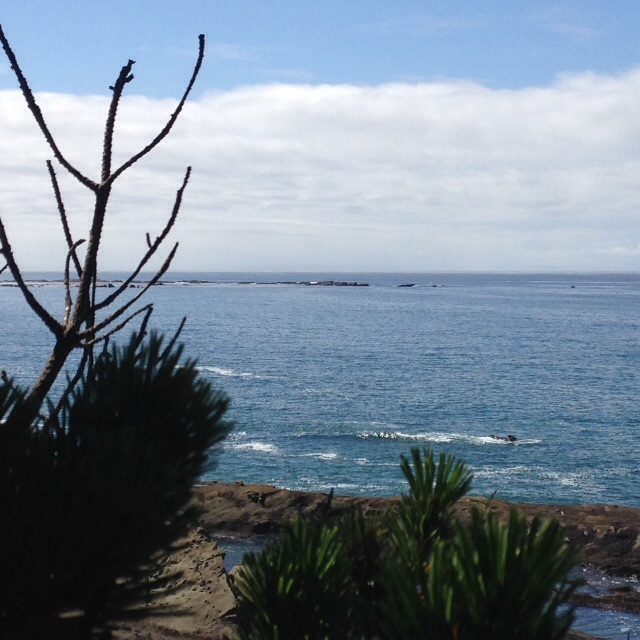 Just a couple of weeks ago we were watching the whales spouting and rolling on the ocean surface from Sunset Park with Greg and Sherry. What a treat to be out on the water with close up views. By 5:00 p.m. the wind mostly died, we dropped the sails and started the engine. The ocean was choppy with NW swells. The sunset was beautiful, it’s so difficult to capture the beauty when the boat is rolling. After midnight the thick fog moved in, blanketing the boat with heavy dew, visibility was less than 1/2 mile. A fishing boat passed us port to port and I couldn’t see any navigation lights, just watched him continue North on the radar. Saturday, Sept 19. The morning was blanketed with fog, everything on deck and cockpit was wet, we were both feeling uncomfortable with rolling sea conditions. 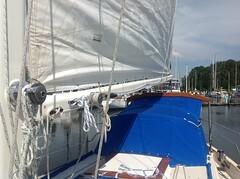 Not enough wind to sail and the engine fumes added to the discomfort. For me, seasickness comes in form of migraine headache. Neither of us had any an appetite, though coffee would’ve helped, I didn’t feel well enough to make it. We took 3 hour shifts the first night but the rolling and banging, slapping sails made it nearly impossible to sleep. Just like the first passage from Astoria, we went without much sleep. The weather forecast was suppose to be fairly calm between Cape Blanco and Cape Mendocino but it turned out to be a little more rough even with the fog. We couldn’t sail, between light winds and big rumbling seas, the sails would only slap and bang across the deck. We motored through 9 hours of thick fog, eyes fixed on the radar with an 8 nautical mile radius. We also have AIS so it was additional insurance to see moving targets near our position and direction. About 7 p.m. we were abeam Cape Mendocino. John had just gone down below for rest. All across the horizon to the west and east of the boat whales were spouting and slapping their tails. I called John up to watch with me. It was amazing to see such a large pod, way too many to count. Tails slapped the water, whale bodies rolled over. We watched totally in awe of their mass. Then all of a sudden a large hump back whale surfaced 30 feet off the starboard (right) side. He didn’t stop as he approached the boat close enough for us to look into his black eyes. I immediately went to neutral to stop the boat and we held our breath as he dove under us. We stood in the cockpit motionless, not knowing if he would try to bump us or come up under the boat was terrifying to me. About 15 long seconds later, he surfaced on our left. I muffled a scream, John was thrilled. The whale dove down again and waved his giant tail at us. An incredible goodbye gesture. We were so enthralled by this giant creature, I was humbled once I got over the pounding heartbeat. Sorry Greg Clark, it happened so quickly there wasn’t time to get a picture. The migraines were worth that very moment. At 8:00 p.m. we hoisted the sails, the winds had picked up from the east, making it easy sailing despite the rolling seas. We moved fast through the water, fast enough that the boat was humming down below, we were in the groove with it. 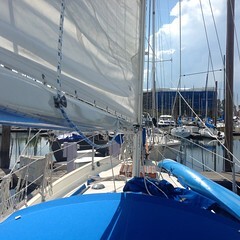 Glorious sailing, 1 reef in the main and full headsail. John was recording 7.0 kts, the boat was riding on her edge. By 10:00 p.m. John called me up on deck to put in a 2nd reef (reduce sail area by pulling it down and tying it to the boom), furled headsail (sail on the bow of the boat)(furled = rolled up the headsail to less than 30% of full sail size). What a ride! 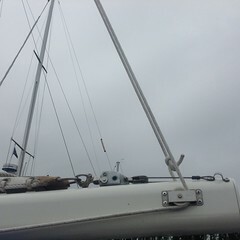 The wind made the standing rigging (wires that hold the mast up) shriek. The boat was moving fast and the wind speed continued to build. 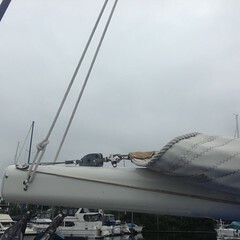 At midnight, John again called me up on deck to drop the mainsail and furl more headsail. Took us a while to get the main sail down in the wind and dark. The physical strength and stamina it took to wrestle with flogging sails, hanging on to the boom and balancing on the rolling deck made John very tired, I was tired just watching. We sat together huddled under the blanket, stared at the billions of stars, watched and listened to the foaming waves whoosh past us. Hard to imagine, but it was a very romantic moment in our sailing adventure. The day was filled with close encounters with nature, we are so small in this world. Sunday, Sept 20. The morning started with the sickening diesel fumes, the sea state was extremely rough, mountainous waves rushed at us from behind, a cross swell pushed us onto our side. Dishes, papers, anything and everything was sliding around, clanging and banging. At noon we hoisted the sails, reefed the main sail, rolled in some of the headsail, and we sailed down the coast. Shake, Rattle and Roll, the name of a 50’s blues song, that was us. At one point I asked John if this is what “cruising” will be for us. I think I would’ve taken up backpacking instead. I can be physically exhausted, smelly and wearing the same rumpled clothes for a lot cheaper and closer to home and family. Through the night we continued rolling, with the miles whooshing wildly under us. Monday, Sept 21. A huge change in scenery and most of it changed out of our view. A total shift in perspective, that’s all it took. We entered a calm Bodega Harbor just before the sun peeked over the soft naked mountains. The smell of sweet desert, giant fluffy palm plants cover the banks of the natural jetty. We motored into the perfectly manicured channel to fuel up. The marked channel is like a bike lane on land, no anxious moments of staying in the deep water. We’re anchored here for a couple of days before continuing on to SF. 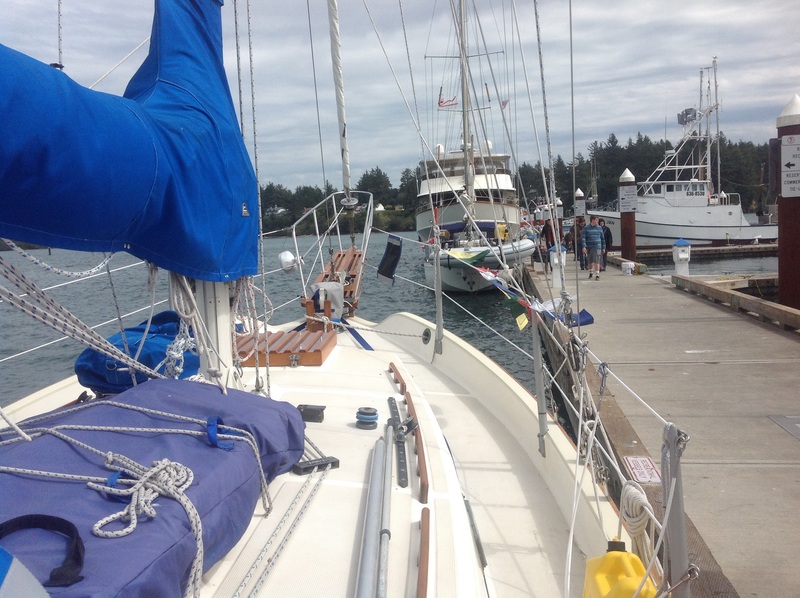 It’s sunny, calm water and gentle wind, the boat is tidied up, we changed out of our foul weather gear, the same clothes that we left Charleston in, (yes Mom, we did change our underwear) into shorts and teeshirts – though we still smell. This is what cruising life is suppose to be. A sense of accomplishment and awe after a long rough ride. John and I have a song by Van Morrison that we share from the day we met, “Into the Mystic” heartfelt and moving: “smell the sea and feel the sky, let your spirit and soul fly into the mystic” We are this adventure, we want to rock our gypsy souls into the mystic. We’ll post photos in Flikr when we have fast wifi. Great Day for Sailing, Bound for San Fran! We’re off the dock at 9:30 a.m. and so are several other pleasure craft. The sun is bright, it’s relatively warm, we have mostly clear skies with a few cirrus overhead. The forecast is good for downwind sailing, perhaps a rolly sail but the seas and winds should be kindly enough so that we can get some sleep on this passage. We said our farewells to family with a wonderful dinner. Lots of hugs, smiles and a few tears last night as we were dropped off at the dock. We will miss our family but knowing they are following us on the Yotreps report, Skype and with some cell coverage down the coast keeps them close. Next stop San Francisco where my sister and family are excitedly waiting. We’re anticipating to see the Golden Gate from the ocean, I hope the fog will oblige us so we capture some beautiful pictures as we cross under it, with full sails up too. A big Thank You to our followers and for those who are wondering what happened to our cruising plans, we’re still in Coos Bay waiting for the weather opportunity. The boat is ready and we’re checking the forecast every 12 hours. “Where is Konami” Yotreps position report, this is a GPS position report that we send in to update our position while underway. A Google earth will show a red balloon indicating Konami’s position. We will update our position with weather and sea state in the comment section. If you don’t see our position on the map don’t be too concerned, it may take a few hours for the web people to update the reports. It’s all done by volunteers and the developers of the website. The Marinetraffic.com or Vesselfinder.com websites will track us as long as there is wifi station for these two websites going down the coast, spotty in some areas. 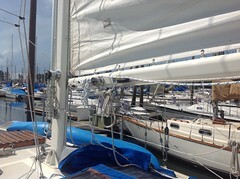 We are at the Charleston dock with two other sailboats waiting, waiting. The rain is coming in this afternoon and it’s very chilly. Even the dockside crabbers aren’t staying long. The seas are confused, a little more so than us, the winds are suppose to pick up around Cape Blanco this afternoon as a front rolls in from the southwest. From the weather forecast we’re thinking Thursday afternoon or Friday. 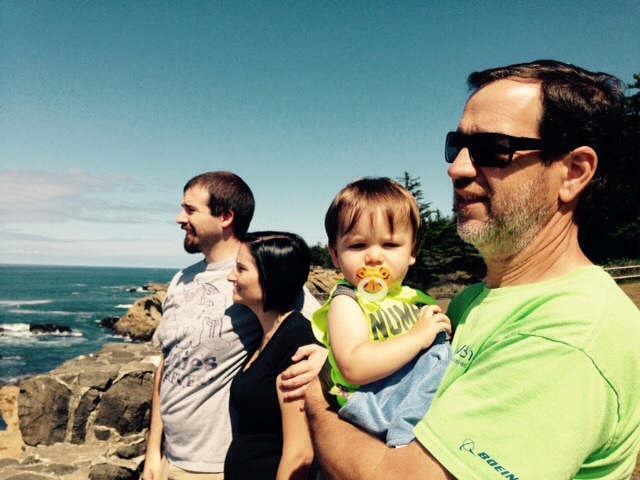 We need a good 2 – 3 day window to get around Cape Mendocino and into San Francisco. The boat is clean, very secure and everything is stowed better than when we came down the coast. A sailboat came in this morning out of Port Townsend, WA and the two fellows were staggering around on the dock trying to get their balance back, they came down with the strong northerly winds nonstop, woot for them, tough guys. I don’t particularly care to look the way they did with baggy eyes, rumpled clothes that were slept in for 5 days and smelling like there wasn’t a shower on the boat… but reality being what it is, we may well look like they did. So please, get out there and do some Sun Salutation poses for us, wish us lots of patience while we wait. The Waiting Game. It was supposed to be a quick bottom paint job but unanticipated alternator rebuild with a new rotor, cutless bearing replacement and pulling the manifold/intake off to replace the rusty soft plugs kept us stuck on the hard for a couple extra weeks. We used the time between watching the paint dry and waiting for boat parts to arrive to redo the brightwork and a few extra projects that makes Konami outstanding. We will miss all the amenities of living in a house, but we’re anxious to get back to living on our boat and prepare for our next adventure, bound for San Francisco. We’re watching the weather, preparing meals for days at sea, repacking our clothes and belongings, and stowing all the gear and tools that were pulled out to do the boat work. I say I’m anxious to go but then a heavy heart will overcome me. I could spend more time with my Mom drinking tea and reminiscing about all the trips we’ve taken together, canning projects we shared, talking about the grandkids and life experiences but the longer we stay the harder it is for us to part. 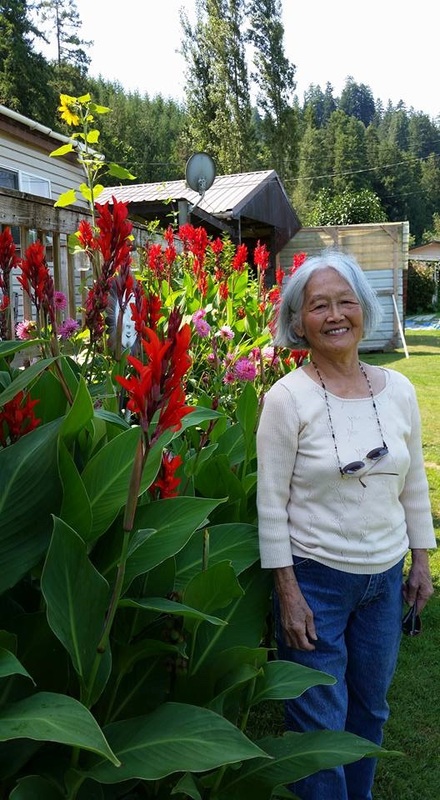 Mom is 86 years young, has a lot of energy so I’m hoping she will meet us in Japan, our planned destination in a couple of years. 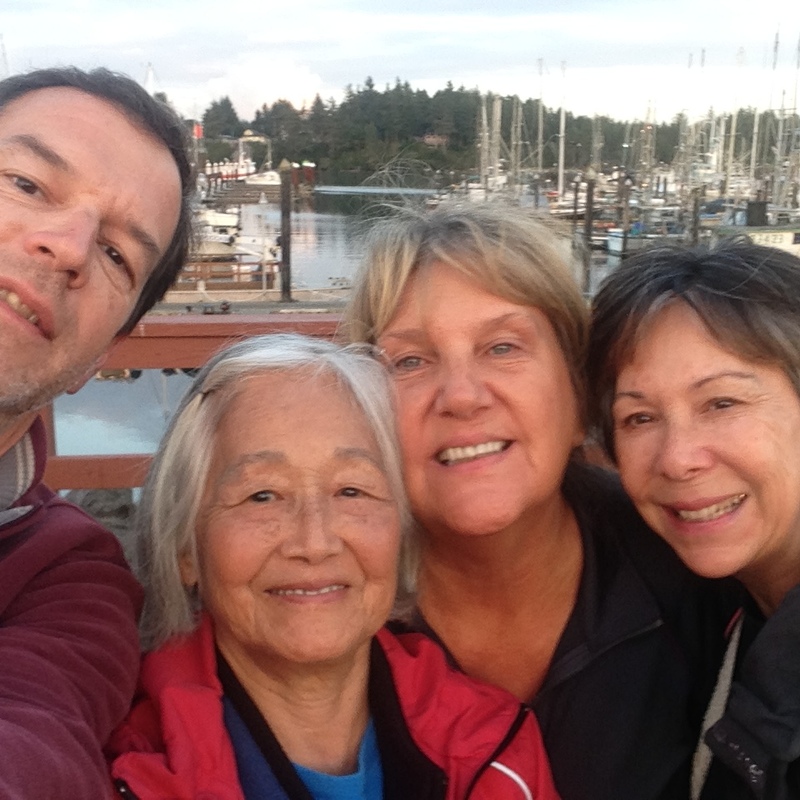 Mom’s neighbor – my very good friend will help watch over her and I’m grateful to know she won’t be too lonely while we’re away. Today we spent hours at the beach together, overlooking the ocean where my dream began over 40 years ago. I would sit up on the bluff and stare out on the horizon where the ocean and sky became the same plane of existence. Mom would point to the far distant and ask me if I could see Japan. “Oh, there’s Tokyo Tower!” she would say. I knew then I would sail across the ocean someday. That time has arrived and the cost of cruising is more than just a financial spreadsheet. It’s a personal cost of sailing that all sailors experience. 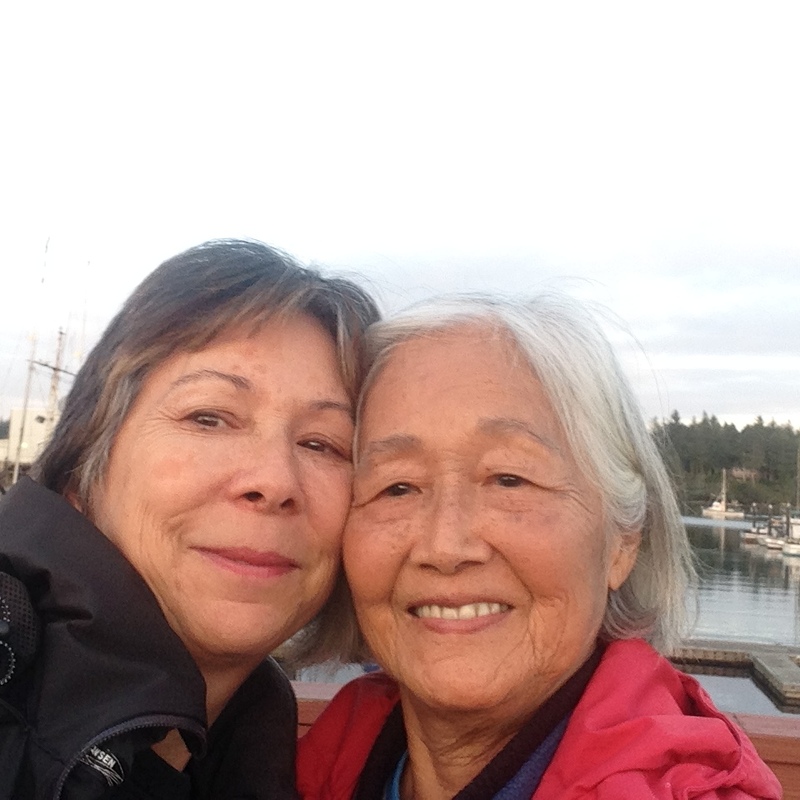 I ponder my Mom’s health and well being, I find myself questioning our timing but just as I surely knew then I would sail a boat, I see Mom greeting us at the dock somewhere, in the future. I have just a few days left with her and I’m trying to help her remember the Skype function, practicing reading her email, doing all the updates on her Ipad so she can follow us. Oh and the last minute canning blackberry jam. It’s been a wonderful 30+ days with Mom and Sis, sons and families, and close friends but after smelling the fresh ocean air today, John and I are ready.